GE Healthcare has partnered with the government of Sweden to open a SEK 145 million (approximately $15.9 million) center in Uppsala that focuses on advancing manufacturing capabilities and the commercialization of new technologies in life sciences. Testa Center is a 2,500 square-meter (27,000-square-foot) facility that houses four bioprocessing laboratories with GE Healthcare technologies for testing new discoveries intended to enable the production of biopharmaceuticals—including bioreactors with working volumes up 500 L for mammalian cell cultures (50 L for bacterial) and chromatography equipment from lab to pilot scale. Open to academia, startups, and industry, Testa Center is designed to help organizations achieve a more time and cost-effective way to reduce the risks of securing industrial Proof-of-Concept, in order to support the development of digital, technical, and biological innovations. “Many of our products are now being purchased by people who perhaps have less experience in biomanufacturing. There is considerable demand to help these individuals negotiate the biomanufacturing process and to make sure that they can optimally utilize our products,” Nigel Darby, Ph.D., an advisor to GE Healthcare CEO Kieran Murphy, told GEN during a visit to the company’s largest life sciences site globally in Uppsala. 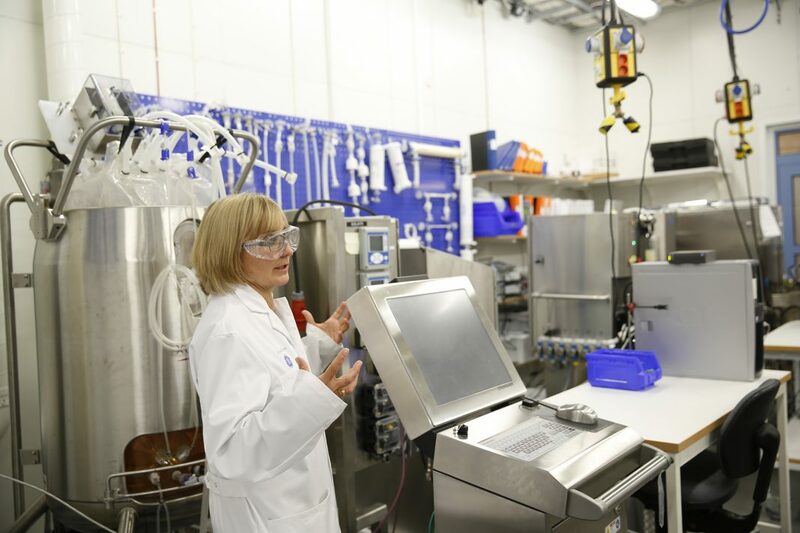 The Center’s industrial-standard bioprocessing laboratories up to pilot scale (non-GMP) are mainly based on single-use technologies from GE Healthcare Life Sciences. The center is owned and operated as a nonprofit company by GE Healthcare in Uppsala that also provides operational support and expertise for project owners. Project owners retain full control of their intellectual property and data, GE Healthcare said. Testa Center was opened with SEK 100 million ($10.9 million) from the Swedish government through its innovation agency, Vinnova, and SEK 45 million ($4.9 million) from GE Healthcare. Additional sponsors of Testa Center include Sweden’s national life sciences facilitator SWElife, Region Uppsala, the industry organization Uppsala BIO, the Swedish Agency for Economic and Regional Growth and the Foundation for Collaboration between the Universities in Uppsala, Business, and the Public Sector (STUNS). Testa Center seeks to apply within the life sciences the open innovation and collaboration approaches that GE Healthcare has sought to foster at another of its life-science hubs—Innovation Village in Cardiff, Wales, which opened in 2015—as well as at Health Innovation Village, a hub for digital healthcare startups the company opened a year earlier in Helsinki, Finland. Testa Center’s goals align with those of Sweden to strengthen its capacity for innovation and thus its economic competitiveness by catalyzing collaboration between the public sector, industry, and academia. Earlier this year, Sweden established an office focused on promoting the nation’s life sciences sector. Last year. Sweden’s government announced a partnership with Swedish regenerative medicine firm Xintela toward a six-year project to establish a Center for Advanced Medical Products (CAMP) research center focused on cell and gene therapy. The center will work with GE Healthcare and other corporate giants, and will be part of CAMP’s SEK 320-million ($35-million), eight-year initiative to position the country as a leading biologics developer. The first company to use Testa Center, BioLamina, plans to scale up its production capacity, with the goal of delivering more reagents to its global customers. BioLamina develops and manufactures protein-based reagents, or Biolaminins™, that are intended for use in developing therapeutic cells from stem cells. On May 16, the company said it was partnering with Novo Nordisk to support the development of new cell therapies targeting Parkinson’s disease, heart failure, and loss of vision. “With the increasing demand of our high-quality laminins within the cell therapy industry, we need to scale up our production capacity. Testa Center gives us a unique possibility to do this internally instead of relying on large global contract manufacturers,” added BioLamina CEO Kristian Tryggvason.